A smarter way to communicate. 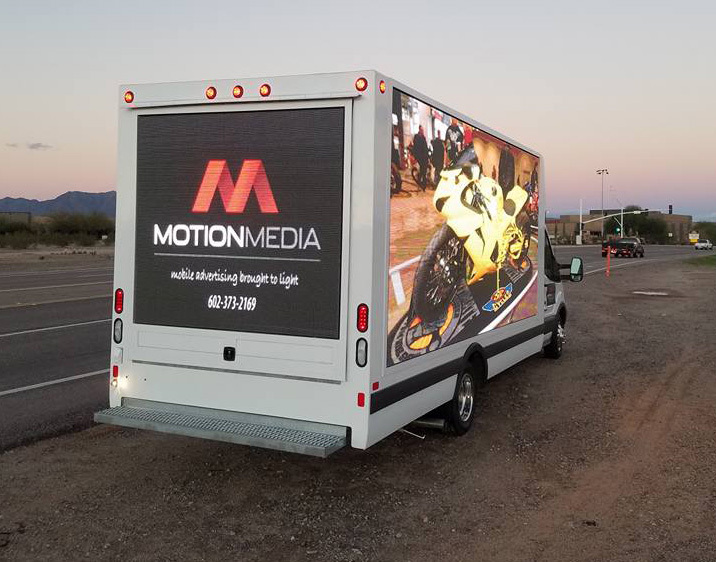 Motion Media, a Phoenix based company, was formed to change the way you advertise and to put your company light years ahead of the competition. Looking for a new eye catching way to advertise your business and promote your business, then you have come to the right place. Motion Media has LED displays and technology that has taken advertising to a whole new level. 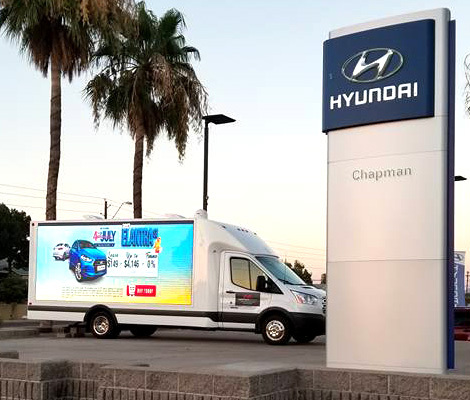 To ensure more consumers are reached, we take your advertising directly to the consumer (on the street, or selected location) rather than hoping your customer passes by a fixed sign in a single location. A high-end video processor allows us the capability and versatility to display any kind of moving or still imagery; from a simple slideshow of JPG images, to live video from a satellite receiver or game console. It’s even possible to combine all three screens to display the same image or source, or show video on one side, video games on the other, while showing a slideshow of ads on the rear. Mobile advertising is one of the fastest ways to create awareness for your brand, business or promotios. 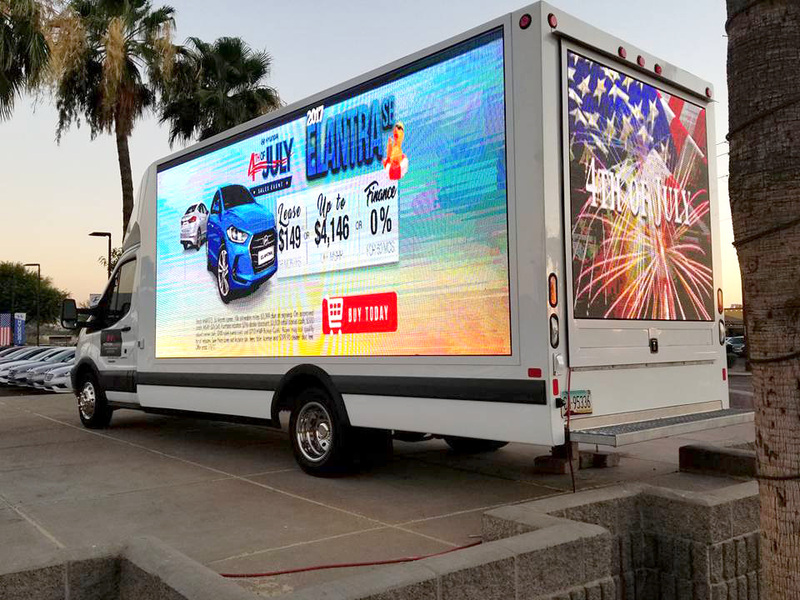 Our giant mobile LED billboard trucks have what it takes to not only grab the attention of your target audience, but motivate them to respond. At Motion Media, no job is too big or too small. We can handle any campaign and provide a wide array of services for all kinds of events and promotional advertising of your business. What type of images can you display? 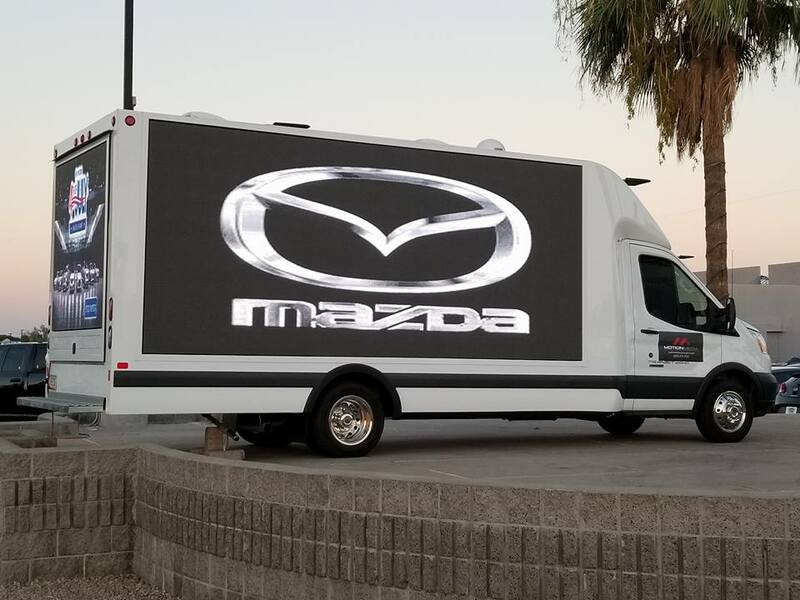 Our trucks display images in a JPEG format. Can you display different images on all three screens? Yes we can. Our switching systems allows us to match all three screens or play different content (i.e. video and images) on different screens depending on your needs and requirements. Can you play video files? Yes, we can play most all video formats. Can you play movies, live feeds or something on TV? Yes, our truck have state of the art satellite system and video processing modules to allow us to play most any live feed that’s available. Can you play 2 different videos, one video per side at a time? Yes, we can play 2 separate videos, 1 on each side of the truck simultaneously. Can you see the screens during the daytime? Yes the LED screens are just as bright as the digital road signs you see on the highway’s Please see our videos showing the trucks in action during the day. 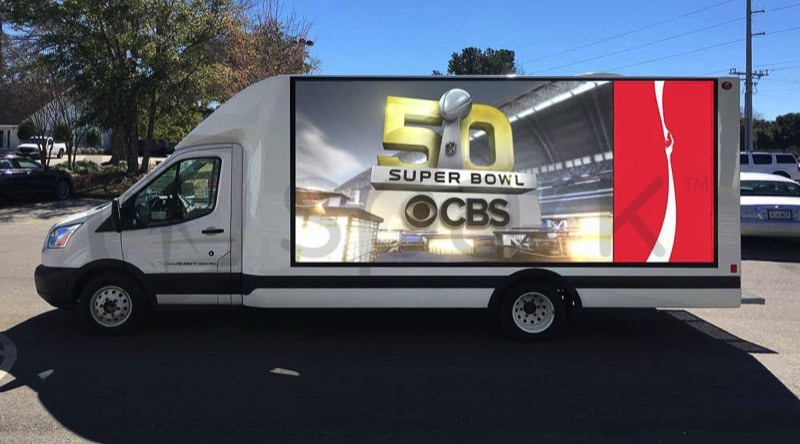 Traditional media advertising can be very expensive however Motion-Media trucks with our state-of-the-art LED screens can design a program to fit every budget. Click here to contact us. Yes, there is a high quality sound system that is external to the truck, so you will hear all your audio from your video file.